Growing up, my mother always insisted that being a weirdo was/is a good thing. My favorite motto of hers that has stuck with me till this day is, “Being called ‘weird’ is a compliment.” I have taken this motto to heart and will most certainly pass it on to my unborn children. I used to get mad at my mother when she would do things like perform silly dances in front of my friends when my back was turned or perform silly dances in front of my entire school during my Senior year basketball awards ceremony (held directly after our last home game and right before the men’s last home game–ensuring the maximum amount of students would be in attendance). But now, I can appreciate how much of a weirdo my mom is and how she has a great love of life and doesn’t take it too seriously. I too will reiterate to my own future children, “Hey, wouldn’t you rather have weird mom than a borrrrring mom? !” Another reason I appreciate my mom is that she allowed me to be a totally strange kid with a big imagination and she never made me feel ashamed about it. I had two very distinctive alter egos growing up: Cindy Morgan and Sassy Jordan. Cindy Morgan was an homage to my father’s cousin Cindy who I thought was the prettiest and nicest person ever. It was a horrible tragedy and quite the karmic conundrum that has boggled me my entire life as to why she accidentally contracted the HIV virus via blood transfusion in the 80′s. I can’t understand why the higher powers would let such an incredible woman die so young but that is another conversation for another day over several glasses of bourbon. Any way, Cindy Morgan was used when I wanted to perform my awesome hula hoop tricks or a fashion show of my latest Old Navy finds from back to school shopping. Cindy Morgan was conservative and talented. Sassy Jordan was another beast. 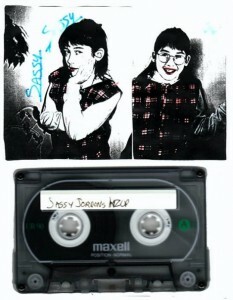 Sassy Jordan was a British DJ working for the fictitious radio station WZUP (what’s up?!). My inspiration for Sassy Jordan was the funky MTV VJ Downtown Julie Brown. I imagined Sassy would wear tight leather pants, strappy crop tops, way too much eyeliner and would get hit on by famous drummers left and right. She had a show based on interviews with locals and sprinkled with some sweet beats recorded off Wild 94.9 (mostly artists like Keith Sweat and Blackstreet). Basically, I interviewed my friends and family using a horrible British accent and we talked about lame stuff but got a KICK out of it. When I had completed both A and B sides of my Sassy Jordan cassette tape, I declared, “I MUST make album art for this culturally significant cassette tape!!”. Naturally I turned to my mother to be my Production Assistant for this project. I would be the Creative Director, obviously. I scheduled a photo shoot with my mother a few days in advance and asked her to meet me by the pool table with her 35mm Minolta and several rolls of film. She showed up on time, completely prepared which was a great sign of her professionalism. I certainly did not have tight leather pants, strappy crop tops or eyeliner at the tender age of 9 or 10, so I settled on wearing my favorite sleeveless hooded flannel vest for my shoot. Mom told me I looked great. For the first few frames, I decided to take off my round Coke bottle glasses for a sexier, more rock and roll look. I took some photos smiling and some with a seductive stare. The second round, I put my glasses on and went for a more studious look that might appeal to an older crowd–you know, like 15 or 16. Throughout this entire photo shoot, my mother did not laugh at me or try and rush me through it. She patiently sat there listening to her little preteen explain her vision for her epic album cover. After it was all done, mom scheduled a time to meet with me again in a few days after she got her film developed. I penciled it into my Hello Kitty day planner and waited anxiously for that day. I love to think about the pimply stoner kid at Long’s Drugs developing my photo shoot film. I’m sure he turned to his coworker, high on developing fumes and laughed, “Dude. Check out this weird awkward girl. What the hell do you think this is for? So creepy.” They may even have a secret photo album of strange photos that they keep under the counter that gets brought out at Christmas parties when everyone is drunk on egg nog. If they do, I’m surely one of these photos. When my mother came home from Long’s, I could barely contain myself. We laid out the dozens of photos and narrowed them down to ten. Then five. Then three. Then THE ONE. For the cover, I decided on the photo of me without glasses turned slightly to my right, staring straight at the camera without a smile, but with my left hand gently resting on my left cheek. For the inside of the cassette tape, I chose a photo with my glasses on, looking straight at the camera smiling a toothy, braces ridden grin. In both, my flannel looks awesome. Just one more step to completing the Sassy Jordan cassette tape: color. I went and got my nicest colored Pentel felt tipped pens and gave myself some flamingo pink lipstick, sky blue eye shadow, and topped it all off with a stylized “SASSY” that was strewn vertically along the left side of the photo. Using my Mariah Carey “Music Box” cassette insert as a guide, I trimmed and glued the photocopied paper so that it fit PERFECTLY inside the case. I stepped back to admire my masterpiece and almost shed a tear at how perfect it was. Mom too was very impressed and beaming with pride. Dad: not so much. I’ve moved maybe 10 times in my life from apartment to apartment. Clothes, dishes and DVDs get lost with each move, but I’ve made sure to keep a close eye on my Sassy Jordan tape. It’s one of my most cherished items even though if I actually listen to it again, I’d probably die of embarrassment (side note: who has a tape player? Let’s have a listening party). The tape, now proudly sitting on the mantle above our fireplace, is a reminder that kids are weird but so are parents. When I stop and think about the strange tics that I have or the OCD-induced way that I have to tap my car window if I see a car with only one headlight, I stop and remind myself that being called weird is a compliment.